As you may know from reading past posts, my wife and I bought a first house, a fixer-upper, in Los Angeles and we slowly work on it when we have time and money to do so. We do all the work ourselves, with our own little hands, and only occasionally bring in some muscle when I don't feel like dislocating my back. Although the house is definitely livable, there are still soooooooooo many things we'd like to do, or have to do at some point. For fun, Pamela and I went around the other day, room by room, inside and out, and came up with a dream list of things we would do if we had the nickels to do it. We're not talking pimping the place out with fancy bells and whistles, but more basic stuff. For example, the stucco needs to be done, it's in pretty bad shape. The driveway is cracked everywhere. The detached garage is hanging on for dear life and the roof will leak like a sieve this winter for sure; things like that. To come up with our list, we decided to use ToDoist instead of just pen and paper. But we also wanted to add prices to each task, i.e. how much will that cost us to do? This was something better suited to Excel, we knew that, but we didn't want it in a spreadsheet. We wanted it in a todo list that we could share between each other, easily delete things (or add things), and we wanted to have it on all our devices and platforms. Entered in each task into ToDoist. We did this on our iPad Air as we walked around the house. All task are listed on the right. You can see the Labels which are actually, estimated costs for that tasks. The thin colored bars to the left of some tasks indicate priority (no color means lowest priority). The beauty of this system, and of ToDoist, is that we can filter for the Labels that we want to at any given moment. So let's say we have saved up $500, we can say, "We have $500, what should we do now?" Bam, we can do a search for $500, or $350, or whatever, and we can see what those things are and tackle that as our next project. ToDoist, also lets us prioritize the tasks for even more fine tuning. I can filter by "Priority 2" and I get those tasks as well. Here we have filtered by Priority 2. That central air looks good right about now! 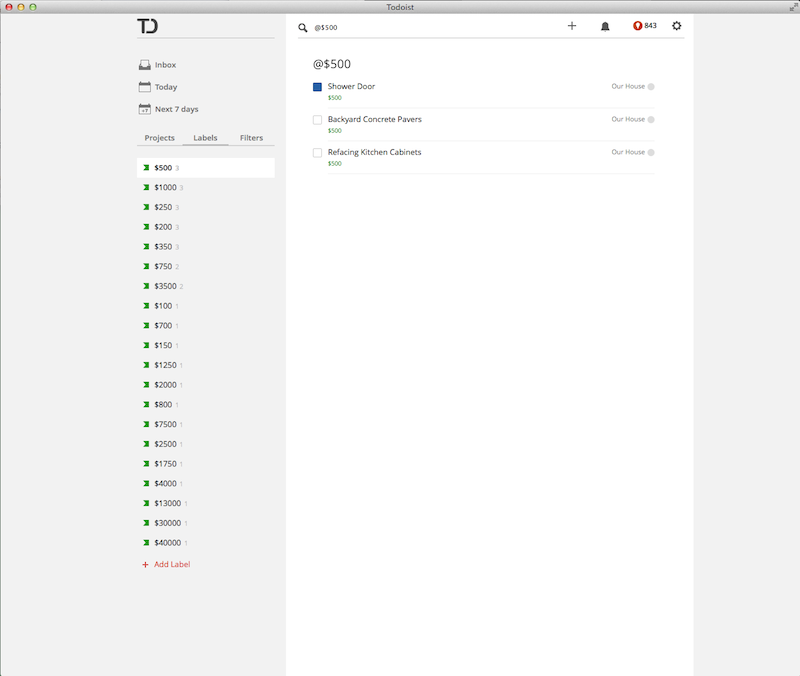 So far we are very happy with this system and we love ToDoist as a tool for helping us get all this stuff done. It's easy, it's fast, it's clean, and gives you the level of detail you want, when you want it. If you've never used it, I would say check it out. Lastly, the costs you see for our tasks may raise some eyebrows. "How can they do that for so cheap?" Well, we do everything ourselves so those costs are really for materials only. Also, we're creative when it comes to stretching our dollar; you have to be. *Labels are a Premium feature, so you'll have to pay for it. But for $30 a year (that's like $.08 a day), it's a steal.